January 13, 1930: “The Gumm Sisters” (Judy and her sisters) performed as part of “Big Brother Ken’s” show, over KNX Radio out of Los Angeles, California. January 13, 1935: “Frances Garland” (Judy) performed as part of “Irving Strouse’s Sunday Nite Vaudeville Frolics” at the Wilshire-Ebell Theater in Los Angeles, California. January 13, 1939: This set still of the hallway to the Wizard’s throne room was taken on this day for The Wizard of Oz. Filming on the set took place at some point on or between January 17th and 20th. 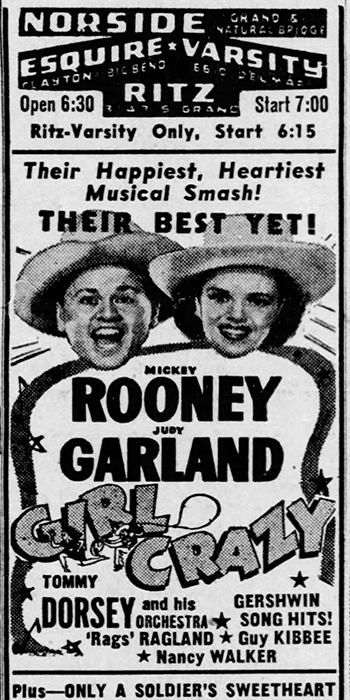 January 13, 1944: Thousands Cheer and Girl Crazy were still in theaters. 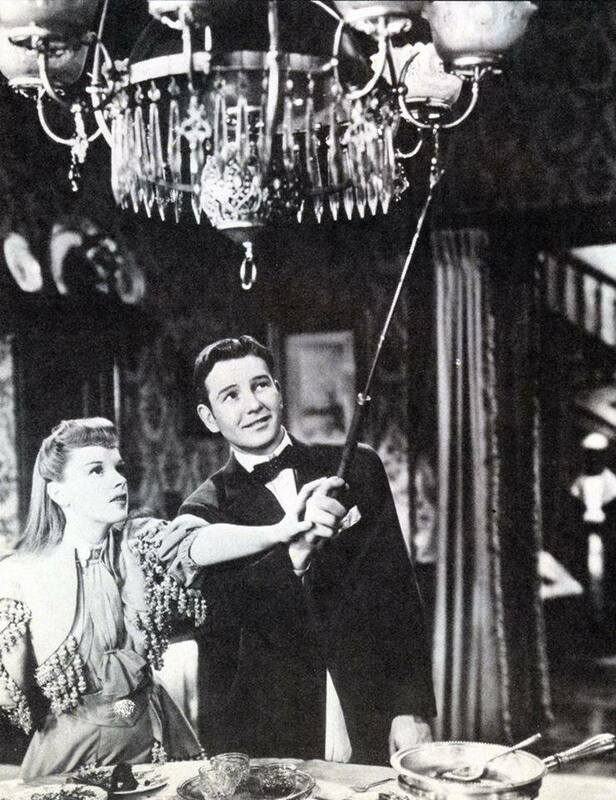 January 13, 1944: Meet Me In St. Louis filming continued. 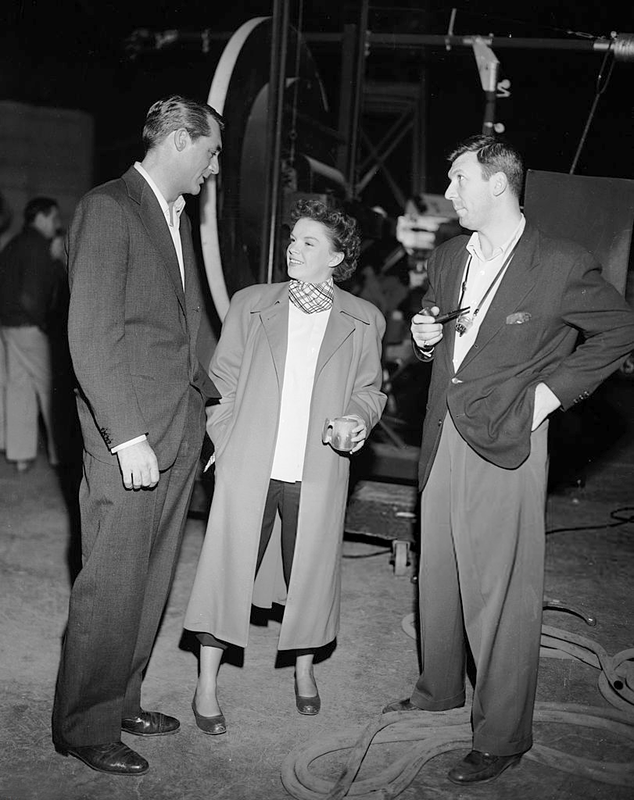 The assistant director’s notes state that Judy was due in wardrobe at 9 a.m. and on set at 10 a.m. At 9:10 a.m., a car was sent to bring Judy to the studio as her eyes were bothering her and she did not want to drive. The car returned with Judy at 9:45 a.m.
At 9:50 a.m., Judy realized she could not find her “toothbridge” (the portable “caps” she wore on her front teeth). Her dentist, Dr. Pinkus, had a spare set. The production’s Unit Manager called the Transportation Department at MGM to get approval to send a car to get the cap. At 10 a.m. a car was sent to get them, returning at 10:40 a.m. with them. At 10:40 a.m. Judy arrived on the set with her hair and makeup done but still in street clothes. For an hour, she and Tom Drake rehearsed the scene where they turn out the lights in the house. 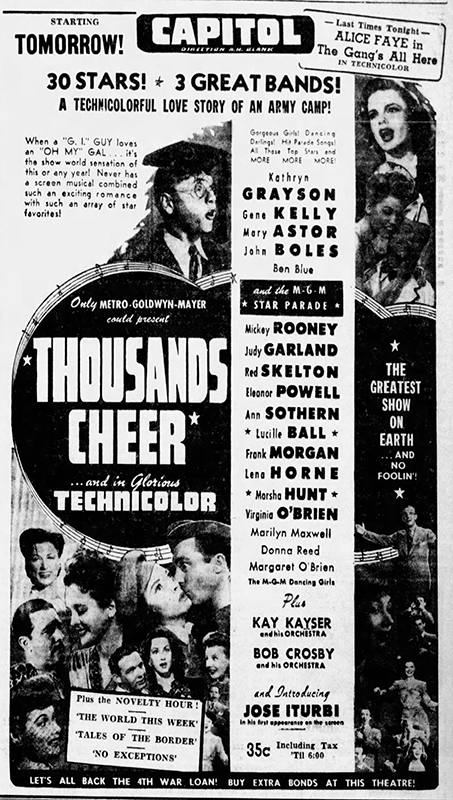 After Judy got into her costume, eleven takes of the scene were completed between 12:16 and 1:30 p.m. After an hour for lunch, rehearsals continued; two breaks were called: one for ten minutes when Judy retreated to her dressing room to be treated for a headache; another thirty minutes at a later point for an adjustment to Judy’s costume. An additional seven takes were completed by 7:10 p.m. when production stopped for the day. Photo: Judy and co-star Tom Drake turn out the lights. Photo provided by Kim Lundgreen. Thanks, Kim! Also on this day, “You And I” was re-recorded. 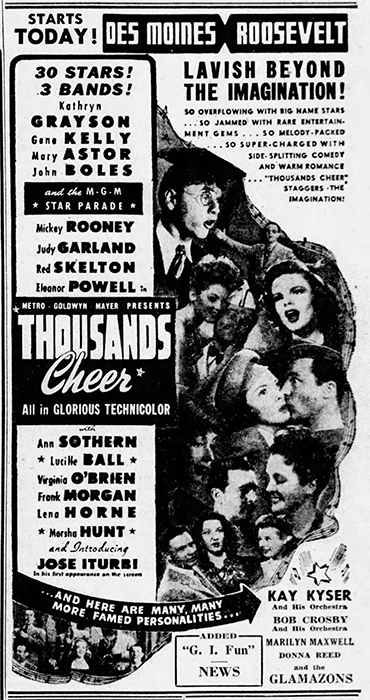 Judy was not a part of the session as it was the one song in the film that she was not a part of. 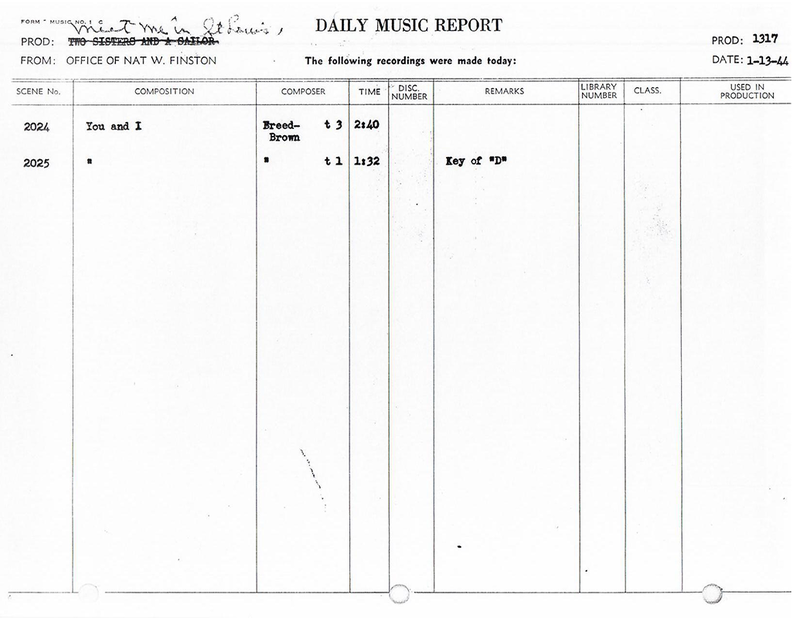 Judging from the Daily Music Report, the session might have been done at the last minute as the production was originally for the June Allyson film Two Girls And A Sailor. Check out The Judy Room’s Special Spotlight Section on Meet Me In St. Louis here. 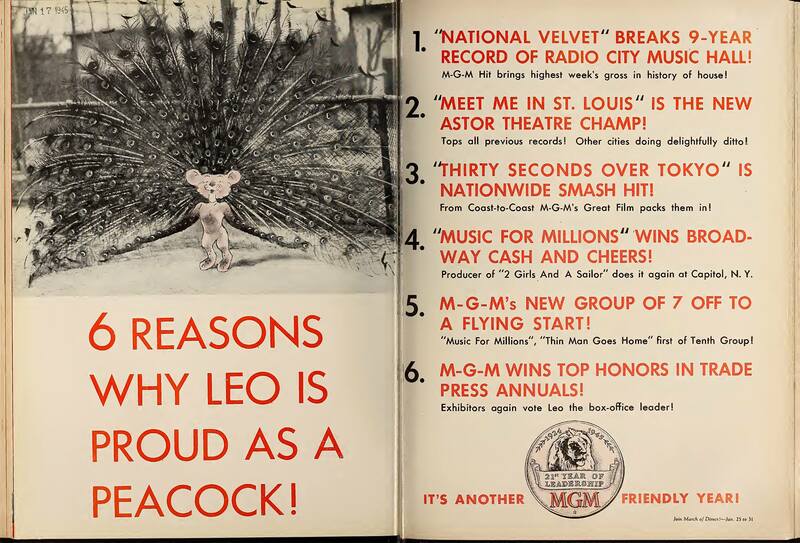 January 13, 1945: These ads appeared in the industry magazines, “Showmen’s Trade Review” & “Film Daily,” promoting the success of Meet Me In St. Louis (among other MGM films) and the upcoming release of Ziegfeld Follies. 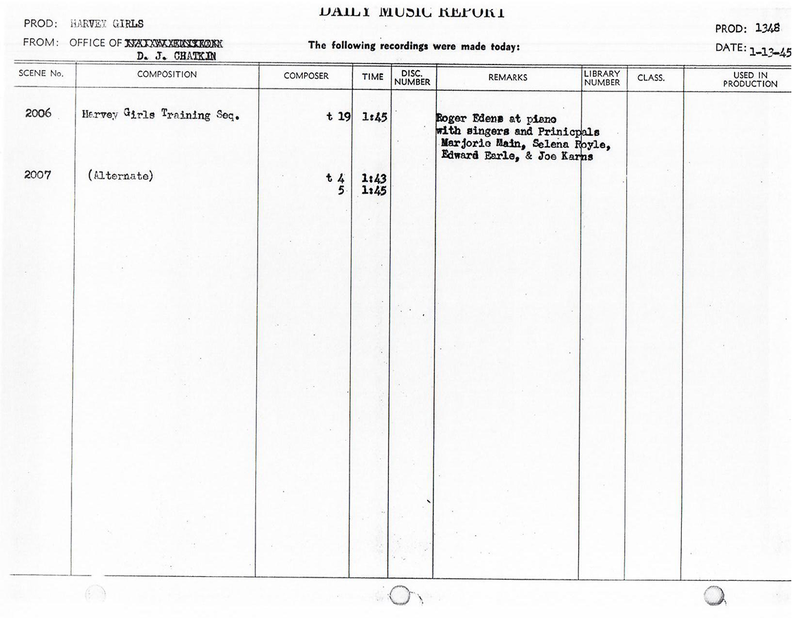 January 13, 1945: The “Training Montage” for The Harvey Girls was pre-recorded, with piano only, provided by Roger Edens. Judy was not a part of this session. The “singers and Principals” sang what became her two lines in the song, “the people gotta eat!” and “again we repeat!” Her lines were recorded later. Judging by the way her solo lines were filmed (extreme closeup) and the fact that it was originally recorded without her, it’s possible that her lines were an afterthought. It was most likely realized that the song needed a little more focus on Judy. Judy spent the day continuing filming of the “It’s A Great Big World” number on the “Interior Dormitory” and “Exterior Dormitory Balcony” sets with Cyd Charisse and Virginia O’Brien. 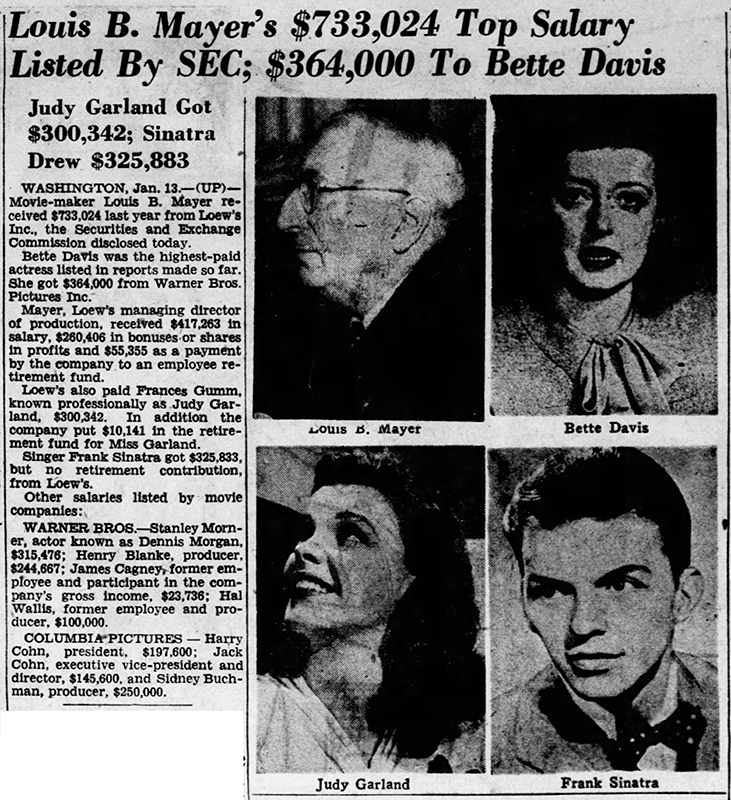 Time called: 10:00 a.m.; dismissed: 5:00 p.m.
January 13, 1949: Judy was listed as one of the top Hollywood moneymakers. What’s interesting is that the article notes that MGM had placed money in a retirement fund for her. It also noted there was no retirement fund for Frank Sinatra. If there was any fund set up (and it’s doubtful) it was nonexistent by the time she left the studio. 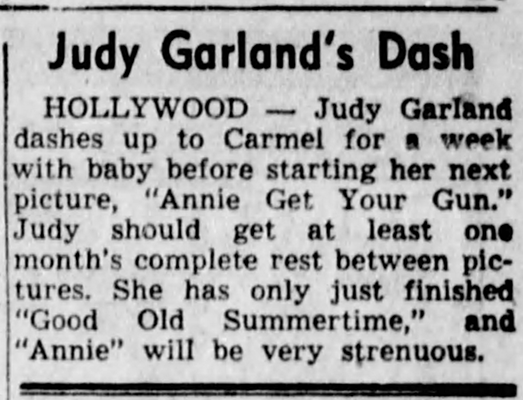 It’s interesting that the blurb above notes that Judy was in Carmel for a quick rest before beginning work on Annie Get Your Gun. 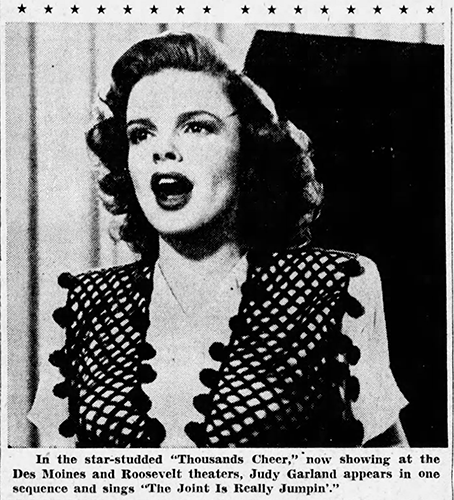 Judy had retakes on In The Good Old Summertime on January 27th and didn’t begin work on Annie until that March. 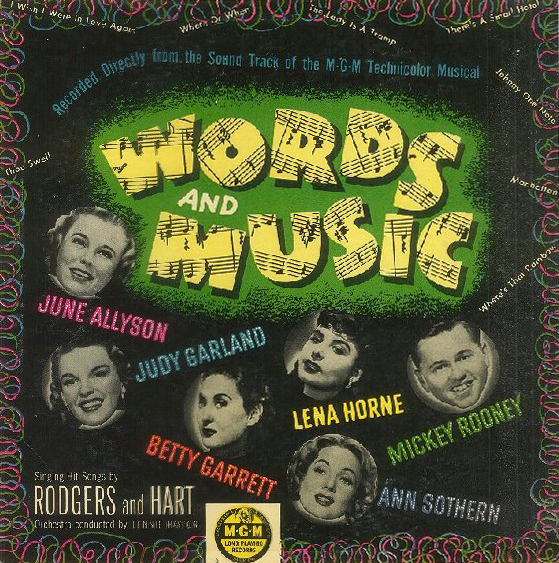 January 13, 1949: In stores, the soundtrack album to Words and Music. January 13, 1954: A Star Is Born filming consisted of more scenes on the “Interior Malibu Home – Party Sequence” set. Filming of the scene had been delayed from December 1953 because Judy was not happy with her original gown. 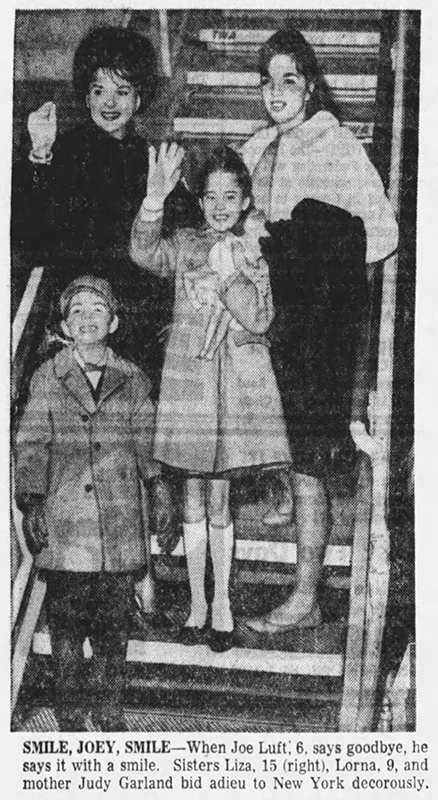 Time started: 10 a.m.; finished: 5:50 p.m.
January 13, 1962: “Smile, Joey, Smile” – The recent photo of Judy and her three children, Liza Minnelli and Lorna and Joe Luft, leaving New York for Los Angeles, was making the rounds of the papers. 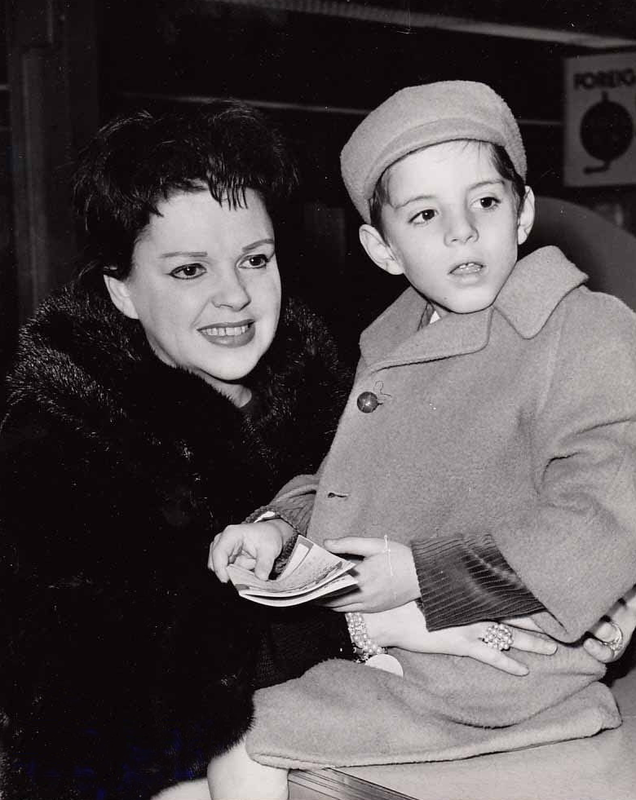 January 13, 1969: Judy recalled her days as a child star. So many commentators have referred to Judy’s “wig” in “Meet in St. Louis.” Actually, while she clearly wore a fall and her bangs were a hair piece, the sides of Judy’s hair is just that – her real hair. A full wig would’ve looked ridiculous. As for her teeth, she should’ve just gotten them permanently capped. It wouldn’t have been a pleasant experience in those days, but her teeth would’ve looked consistently straight. Curious pic of Grant and director Richard Brooks. I love Brooks’ work (“The Catered Affair”, “Sweet Bird of Youth”) but he was supposed to be one of the most horrible directors to work with. Glad Judy never had to do a picture with him! Yes, Judy commented several times in those last months that Mickey Deans was the only love, and the ONLY time she ever found happiness. Had she lived a few more years, they would’ve been finished by 1970.